My daughter sits and plays quietly, almost in her own little world. She has imaginary friends. She loves ‘bling bling’ things such as sequins and the colours pink and purple. The Crystal Child is a natural healer that has a strong association with Atlantis and partially with Lemuria due to the crystal connection. 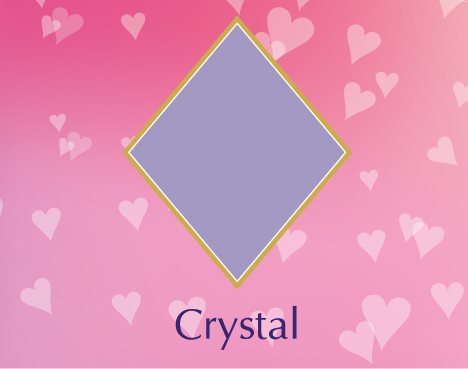 Their love crystals and true understanding of their capabilities is extra-ordinary! Within their cellular memory they retain the memories of Atlantis and how to heal with crystals and awaken people using ‘hands on healing’. In Atlantis the children were apprentices to their Mothers, whom were High Priestesses. At this time they were born in to a particular family knowing they were to learn a particular ‘craft’ and that it was their destiny …. a bit like the Dalai Lama. Their knowledge then and now on healing is so advanced including griding and patterning of the body. In our world it would be considered quantum physics and mathematics. However then, these beautiful beings did not have the need to analyse details – they knew what to do and therefore did it. The Lemuria connection means they are able to call upon the ancient knowledge relating to healing techniques. That is because they understand no duality and that everything is available to them. Consequently these children know the ancient techniques of toning, griding and again crystal manifestation. The main physical disease they will repetitively have is of the nervous system, brain dysfunction and digestive problems. These children will be nervous. This affects the brain function, sometimes creating headaches, bacteria around the brain and any other concepts relating to the nervous system/brain, such as epilepsy, migraines, blurred vision and vertigo. This can also affect their auditory canal, hearing, ear bones and the throat area creating many sore throats and ear aches. The reason for this is that they work on a high frequency such as dolphins and dogs, and the Earth realm is of such a dense vibration. The Crystal Child has intolerances to both wheat and sugar. The Crystal Child is very sensitive to noise, screaming, loud and abrasive music and require gentle, peaceful and harmonic surroundings. Their main concern is family harmony and tranquillity. They can be people pleasers so as to create peace. As adults they will find a voice and shall actually create harmony by speaking out. The Crystal Child loves to perform with singing and dancing. They are attracted to sparkly things such as sequins, ornaments, accessories, soft toys and they mimic their parents. An example of this would be a girl carrying a hand bag and pretending to cook – just like Mummy. She would wear Mum’s high heels and talk with her imaginary friends, doing cups of tea. Kylie Minogue is a great example of an adult Crystal Child. When she performs her outfits are always sparkly, feminine and gentle compared to that of Madonna who is earthier. As for imaginary friends – NOT at all! They are able to communicate with many realms of life. These include the Divas (Earth, Crystal, and more), Fairies, Pixies, Goblins, Trolls and Angels. When looking at some of these children, they look and act just like Tinkerbelle. They will relate to Angels and some can look like them with their long blonde hair, gentle nature and quiet demeanour. Such people that look like this are Doreen Virtue. Body shapes for the Crystal Child will vary however at a younger age they will be slightly more ‘plump’ compared to other children. However from the age of 9 years they start to thin out. As adults they may fluctuate with their weight, depending on their personal situation. Professions these children may gravitate to will be of the healing nature and performing. Examples of this are Nursing, Energy Healing, Physiotherapy, Singing and Dancing. Some Crystal children may enter professions such as Accountancy and Book Keeping. They are drawn to this to help ground the left brain and intellect. Being people pleasers, and wanting to please their parents, some of them gravitate to this profession as it ‘appears’ the “right sort of job”. The Crystal Child is drawn to all marine animals, especially dolphins and whales as they are able to communicate with them on a their higher frequency.